Noel, Hans. 2013. 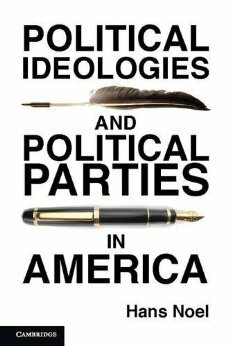 Political Ideologies and Political Parties in America. New York: Cambridge University Press. Political Ideologies and Political Parties in America puts ideology front and center in the discussion of party coalition change. Treating ideology as neither a nuisance nor a given, the analysis describes the development of the modern liberal and conservative ideologies that form the basis of our modern political parties. Noel shows that liberalism and conservatism emerged as important forces independent of existing political parties. These ideologies then reshaped parties in their own image. Modern polarization can thus be explained as the natural outcome of living in a period, perhaps the first in our history, in which two dominant ideologies have captured the two dominant political parties. 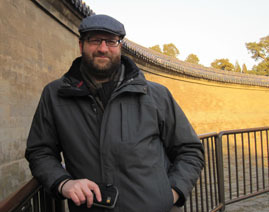 Winner of the 2014 Leon Epstein Outstanding Book Award, given by the Political Organizations and Parties organized section of the American Political Science Association. Cohen, Marty, David Karol, Hans Noel and John Zaller. 2008. 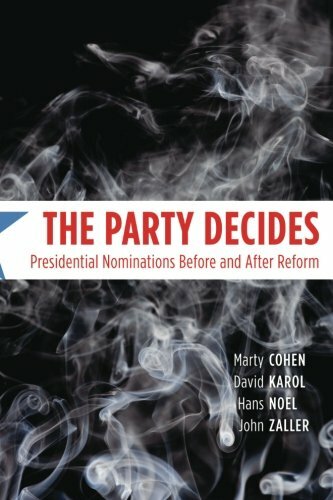 The Party Decides: Presidential Nominations Before and After Reform Chicago: University of Chicago Press. Throughout the contest for the 2008 Democratic presidential nomination, politicians and voters alike worried that the outcome might depend on the preferences of unelected superdelegates. This concern threw into relief the prevailing notion that—such unusually competitive cases notwithstanding—people, rather than parties, should and do control presidential nominations. But for the past several decades, The Party Decides shows, unelected insiders in both major parties have effectively selected candidates long before citizens reached the ballot box. Tracing the evolution of presidential nominations since the 1790s, this volume demonstrates how party insiders have sought since America’s founding to control nominations as a means of getting what they want from government. Contrary to the common view that the party reforms of the 1970s gave voters more power, the authors contend that the most consequential contests remain the candidates’ fights for prominent endorsements and the support of various interest groups and state party leaders. These invisible primaries produce frontrunners long before most voters start paying attention, profoundly influencing final election outcomes and investing parties with far more nominating power than is generally recognized. Replication Materials for The Party Decides. Noel, Hans. 2018. The activists decide: the preferences of party activists in the 2016 presidential nominations. Journal of Elections, Public Opinion and Parties. One view of presidential nominations in the United States claims that the support of political elites is causally related to success in the nomination. The mechanisms for this relationship include party activists, who follow the cues party leaders send and provide necessary support to candidates in primaries and caucuses. This mechanism has not been explicitly tested. This paper explores the preferences of party activists in light of the unified elite preferences among Democrats and the lack of such unity among Republicans. Some activists in each party resist the signals from elites, but the resistance is far less widespread in the Democratic Party, where party leaders exhibited consensus support for the eventual nominee. Noel, Hans. 2012. Which Long Coalition: The Creation of the Anti-Slavery Coalition Party Politics. How are party coalitions shaped and reshaped? Elected officials choose coalitions to win elections, but they must work to maintain those coalitions. Non-elected political actors, advancing an ideology at odds with the party coalition, can undermine the party. This article explores this possibility in the case of partisan change on slavery in the Antebellum United States. Intellectuals in 1850 divided into two camps over slavery and the other major issues of the day at a time when slavery cross-cut the two parties in Congress. The ideological division matches one that develops in Congress a decade later, suggesting that the parties responded not just to electoral incentives, but also to this elite division. As a conference paper, this piece won the APSA Political Organizations and Parties Section/Party Politics Award for best paper at the APSA Annual Meeting. Bawn, Kathleen, Marty Cohen, David Karol, Seth Masket, Hans Noel and John Zaller. 2012. A Theory of Political Parties: Groups, Policy Demands and Nominations in American Politics Perspectives on Politics. Vol. 10. No. 3. This article offers a theory of political parties that places interest groups and activists at its center. This is a departure from standard theories, which have politicians at the center. As we theorize them, parties no longer compete to win elections by giving voters the policies voters want. Rather, as coalitions of intense policy demanders, they have their own agendas and aim to get voters to go along. This article won the 2013 APSA Heinz I. Eulau Award for best article publshed in Perspectives on Politics and the 2014 APSA POP Section’s Jack Walker Award for best article on political parties. Bailey, Michael and Mummolo, Jonathan. 2012. Tea Party Influence: A Story of Activists and Elites 2012. With Michael Bailey and Jonathan Mummolo. American Politics Research. Understanding how the Tea Party has affected congressional elections and roll call voting helps us understand not only an important political move- ment, but how movements affect politics more generally.We investigate four channels for the movement to influence political outcomes: activists, constit- uent opinion, group endorsement activity and elite-level self-identification. We find consistent evidence that activists mattered both electorally and for roll call voting on issues of importance to the movement. Constituent opin- ion had virtually no impact on either political outcome. Group endorsement activity had possible effects on elections, but mostly no effect on congressional voting. Self-identification among elites did not enhance—or harm—Republican electoral fortunes, but did affect congressional votes important to the move- ment.These divergent results illustrate how movement politics can influence outcomes through multiple channels and call into question the usefulness of the “Tea Party’’ moniker without important qualifiers. Noel, Hans. 2012. The Coalition Merchants: The Ideological Roots of the Civil Rights Realignment Journal of Politics Vol. 74, No. 1, pp. 156-173. Over the course of the twentieth century, the Democratic and Republican parties have reversed positions on racial issues. This reversal is credited to a variety of factors, chief among them strategic decisions on the part of party leaders competing for votes. An original dataset of the opinions expressed by political thinkers in leading magazines and newspapers is used to develop a measure of ideological positions parallel to NOMINATE scores for members of Congress. Results show that the current ideological pattern, in which racial and economic liberalism are aligned together, emerged among political intellectuals at least 20 years before it appeared in congressional voting. The finding is consistent with the view that ideology shapes party coalitions. Masket, Seth and Hans Noel. 2012. Serving Two Masters: Using Referenda to Assess the Relationship between Voters and Legislators. Political Research Quarterly. Koger, Gregory, Seth Masket and Hans Noel. 2010. Cooperative Party Factions in American Politics 2010. With Gregory Koger and Seth Masket. American Politics Research: Vol. 38 No. 1 pp. 33-53. Koger, Gregory, Seth Masket and Hans Noel. 2009. Partisan Webs: Information Exchange and Party Networks British Journal of Political Science: Vol. 39 pp. 633–6537. Political scientists use sophisticated measures to approximate the ideology of members of Congress, notably the widely used NOMINATE scores. These measures have known limitations, including possibly obscuring ideological positions that are not captured by roll call votes on the limited agenda presented to legislators. Meanwhile scholars often treat the ideology that is measured by these scores as known or at least knowable by voters and other political actors. It is possible that (a) NOMINATE fails to capture something important in ideological variation or (b) that even if it does measure ideology, sophisticated voters observe something else. We bring an alternative source of data to this subject, asking samples of highly involved activists to compare pairs of senators to one another or to compare a senator to themselves. From these pairwise comparisons, we can aggregate to a measure of ideology that is comparable to NOMINATE. We can also evaluate the apparent ideological knowledge of our respondents. We find signicant dierences between nominate scores and the perceived ideology of politically sophisticated activists. As political scientists examine ideology in American politics, the vast majority of studies conceive of ideology as a continuum ranging from conservative to liberal. However, a large number of those who hold left-leaning political attitudes now call themselves progressive. To date, there has not been significant work in the study of American politics on the difference between those who call themselves liberals and those who call themselves progressives. We examine seven hypotheses to locate systematic differences between these two groups. We find that they do not significantly differ in issue positions, issue priorities, or feelings toward Hillary Clinton or Bernie Sanders. Those holding more sexist attitudes, on the other hand, appear to be more likely to identify as progressives than as liberals. This difference appears to be more social than policy-based. We use network analysis to identify factions among the political elites that express a preference for a candidate in the presidential primaries. Using and building on data from Cohen et al. (2008), we construct a network of endorsers, connected by their common endorsements of the same candidate. We find that while there are distinct communities, these factions do not appear to dier wildly in their preferences over the last several decades of presidential nominations. We consider the relationship between quality media coverage of members of Congress and the nature of representation. We find that were media coverage is of “high quality” (using a variety of measures), voters appear to exercise a delegate model of representation, in which MC’s voting behavior closely maps constituent preferences. But where coverage is poor, voters may not have the information needed to hold MC’s accountable, and those members operate under a responsible party government model, in which MC’s voting behavior follows the party line. We test several implications of the mechanisms implied by this explanation of the empirical pattern. Hans Noel's research is on political coalitions, political parties and ideology, with a focus on the United States. He is the author of Political Ideologies and Political Parties in America , and a co-author of The Party Decides: Presidential Nominations Before and After Reform. He is interested in the way that a focus on competing policy demands helps explain political parties, coalition building and coordination. Noel blogs on political parties and related issues at Mischiefs of Faction. Noel was a Robert Wood Johnson Scholar in Health Policy Research at the University of Michigan from 2008 to 2010. Before coming to Georgetown, Noel was a fellow in the Center for the Study of Democratic Politics in the Woodrow Wilson School of Public and International Affairs at Princeton University. He received his Ph.D. in 2006 from UCLA. From 1994 to 1997, Noel worked for a daily newspaper in Virginia. He is the co-director/co-producer of the award-winning feature film The Rest of Your Life. SOCIAL NETWORKING: I am happy to accept friend requests from current and former students on Facebook or LinkedIn. I generally do not initiate such requests. I set the privacy settings to limit the areas of my life students can see on Facebook, and I strongly suggest that students do the same.